Featuring a large heated jacuzzi with two lay-beds deluxe linen, bath sheets, split system heating/cooling, barbecue, laundry facilities, and all the modern comforts needed for your stay. Relax and appreciate the natural surroundings while staying in this beautiful modern house, which is ideal for couples, honeymooners and romantic getaways. Escape to the serenity of this modern designed property with a touch of class; tucked away just 100 metres from the township of Halls Gap, Hemley House is your perfect Australian bush getaway in a quiet location with 360 degree views, walking access to restaurants, shops, cafes and bush walks. Cuddle up on the plush leather couch near the gas log fire, take in magnificent views from the large light-filled dining and living area, and observe the local wildlife in the backyard from the large north-facing alfresco sliding doors and elevated deck or unwind in the jacuzzi or relax in the large back yard. 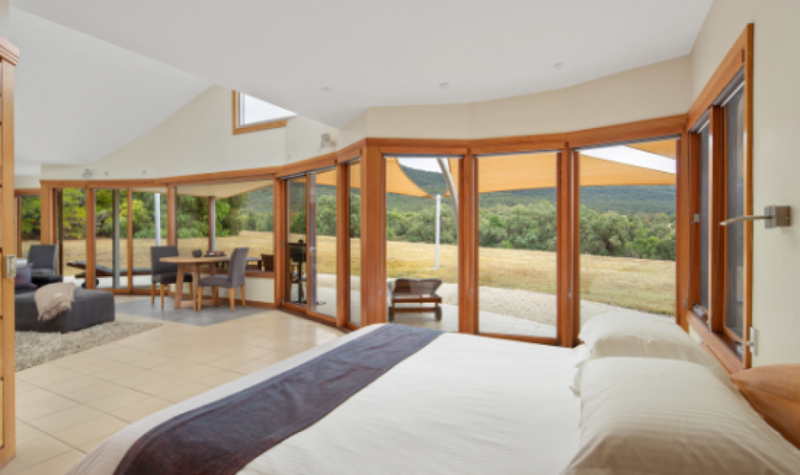 Peacefully secluded with spectacular views of the Grampians yet only five minutes drive from Halls Gap village, Boroka Downs offers romantic, award-winning and luxury accommodation exclusively for couples seeking the ultimate in privacy, seclusion and serenity. The perfect romantic weekend getaway is guaranteed at Boroka Downs with each open-plan residence offering the ultimate in luxury features; enjoy a spectacular sunset over the mountains from the large circular spa, reconnect over a glass of local sparkling by the open log fire or take in a movie with surround sound from the king size bed with a Smart TV which swivels to face bedroom or lounge area. The carefully-considered extras and attention to detail at Boroka Downs create a sense of true hospitality with full self-catering facilities, such as a complete kitchen with Espresso coffee machine for that essential wake-up cup, and complimentary high-speed WiFi for that sneaky bit of work you might need to take with you! For those couples seeking more activity, there are bikes and golf clubs, plus yoga mats and backpacks with walking maps in each room; not to mention the 24-hour access to dedicated onsite owners for all of the local secrets! Named one of the world's accommodation hot spots by Condé Nast Traveler, Meringa Springs in the Wartook Valley is another perfect destination for a romantic getaway. Solitude and privacy are guaranteed at this small luxury lodge which boasts villas offering the ultimate indulgence with double showers, double spa baths, king sized beds and luxurious extras you need to see to believe. Dine at the licensed restaurant with a menu that makes the most of fresh local produce and features an extensive wine list. 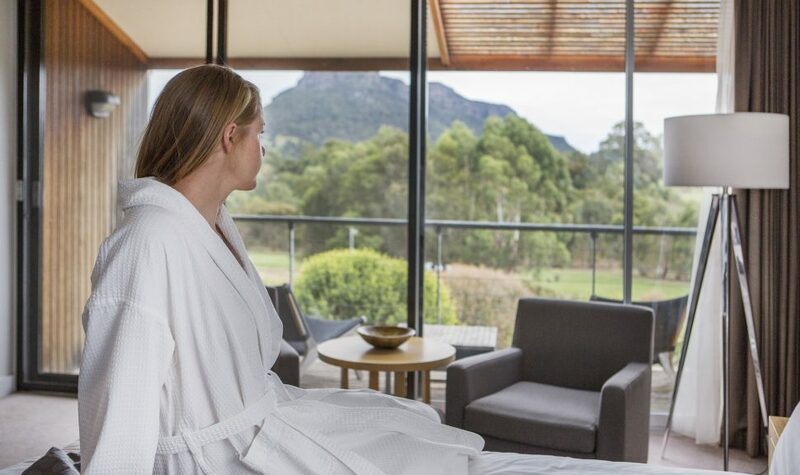 Enjoy the majestic Grampians views relaxing by the stunning infinity pool with a drink from the bar and watch as emus, kangaroos and other native wildlife come and go in their natural habitat. With the plenty of options for walks, plus helicopter flight and horse ride tour operators servicing the area at Meringa Springs’ doorstep, guests have full access to the ultimate Grampians National Park experience. DULC are funky designer cabins on a five acre property nestled amid the beauty of the Grampians. Choose from three contemporary cabins, the one and two bedroom Mountain View cabins are single storey and the Treehouse has an attic in the trees. All featuring elegant minimalist décor, abundant natural light, glass top bathrooms and secluded settings with tree-fringed views, each cabin contains king size beds, espresso machines with freshly ground coffee, gas log fires, Moran leather armchairs and couches, and spa baths with complimentary Molton Brown toiletries. Relax on one of the day beds while reading a glossy magazine or coffee table book which is included in your tariff, or play one of the DVD's provided. The cabins have been built using rough radial sawn timber inside and out and decked out with all the contemporary goodies you could hope for. DULC Cabins have also teamed up with Grampians Helicopters to bring you an exciting special the Stay, Fly, Wine package available until 31 March 2019. Spend 2 nights relaxing in one of the Mountain View or Treehouse Cabins, enjoy complimentary breakfast hamper and bottle of local wine on arrival. Then from Stawell Airport you will be flown over part of the Grampians landing at Montara Wines for wine tasting and Gourmet picnic. 2 night’s accommodation at DULC in either Mountain View Cabin or Treehouse. Scenic flight landing at Montara Wines for tasting and picnic lunch. Artisan Picnic and wine at Montara. Icon Central Halls Gap offers central, yet secluded nature-based luxury spa accommodation for couples and is just minutes' walk to cafes and restaurants, and popular nature walks in the Grampians, including the very popular, Pinnacle Walk. Spend a morning cycling around the little village or hiking in the national park and enjoy the peace, tranquillity and beauty of the rugged mountain ranges. 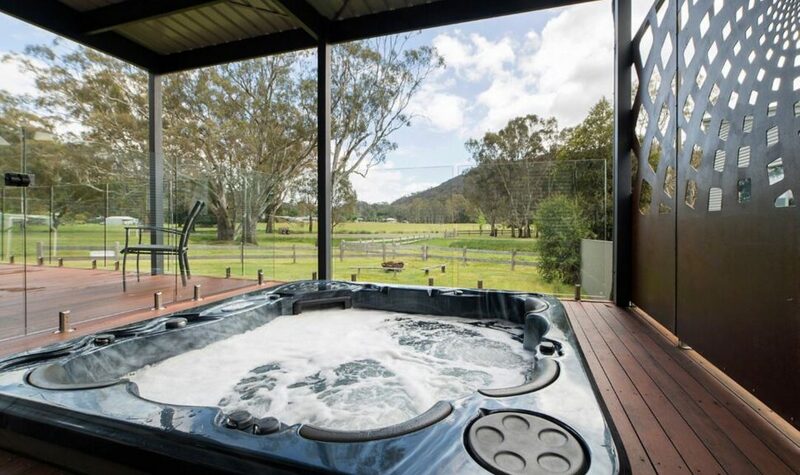 Afterwards, unwind in the master suite's sauna then sink back into the huge oval spa as you watch over Halls Gap valley kangaroos and wildlife. In the afternoon, catch up on some extra work or attend that unavoidable conference call from the fully equipped study, and in the evening choose between a long, romantic dinner in one of Halls Gap's finest restaurants, or stay in and make use of the built-in pizza oven in the private courtyard. Enjoy the open wood fire long into the night as you sip on award-winning local wines and graze on the highest-quality local produce, all thoughtfully selected and provided by your hosts prior to your arrival. End the day snuggled into the cosy king bed gazing out over the sparkling waters as the stars twinkle in the clear night sky. The combination of pure luxury and privacy, stunning mountain and waterfront views close to town, and the considerately curated extras and meticulous attention to the guest experience make a stay at Icon Central an unforgettable experience of true pampering and indulge you will never want to leave. Royal Mail Hotel in Dunkeld is designed to capture the stunning beauty of the Southern Grampians. The property features sweeping views, multi-award-winning dining and cellar, bars, quality accommodation, providing the ultimate setting for that romantic luxury getaway only 3 hours out from Melbourne. 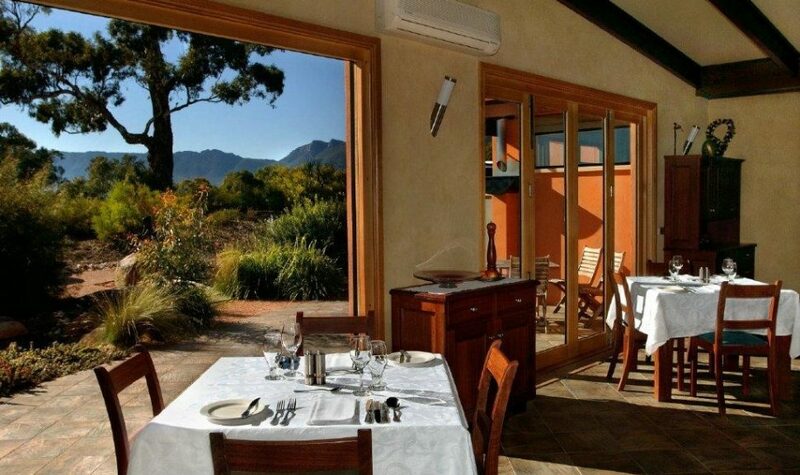 Indulge with your beloved in fine food, fine wine and some of the best views in the Southern Grampians.